Gorge and Adelaide, Southern Cassowaries settling in to On the Perch at Tathra. Photo: Ian Campbell. Tathra’s newest residents are the third largest birds on the planet. ‘Gorge’ and ‘Adelaide’ are Southern Cassowaries, a nationally-listed endangered species. Having hatched on New Years Day this year at the Gorge Wildlife Park in the Adelaide Hills, they arrived at On the Perch Bird Park this week with a lot of growing to do. On the Perch Curator, Steve Sass says his babies will be on display sometime in April, once that have settled into their new surroundings. 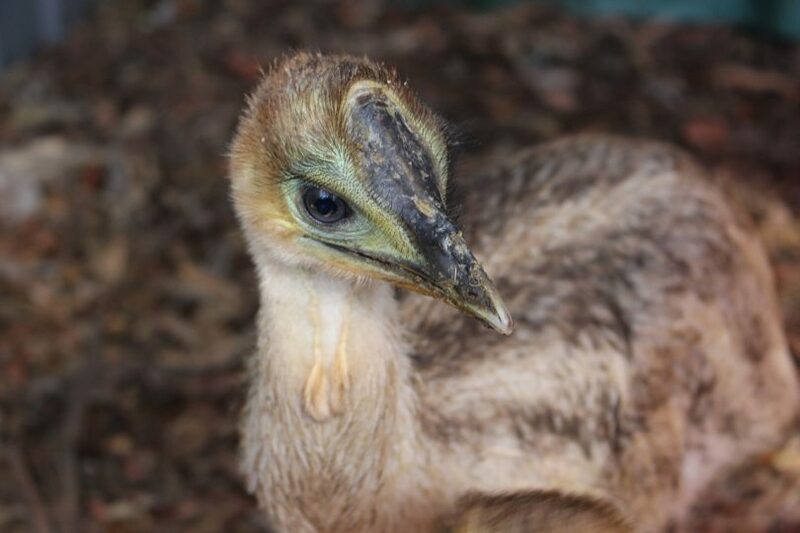 “This is the first time this endangered species has lived in southern NSW and one of the first times that members of the public will be able to watch young cassowary grow up in an Australian zoo,” Steve beams. These big birds hatched at Gorge Wildlife Park in the Adelaide Hills. Photo: Ian Campbell. 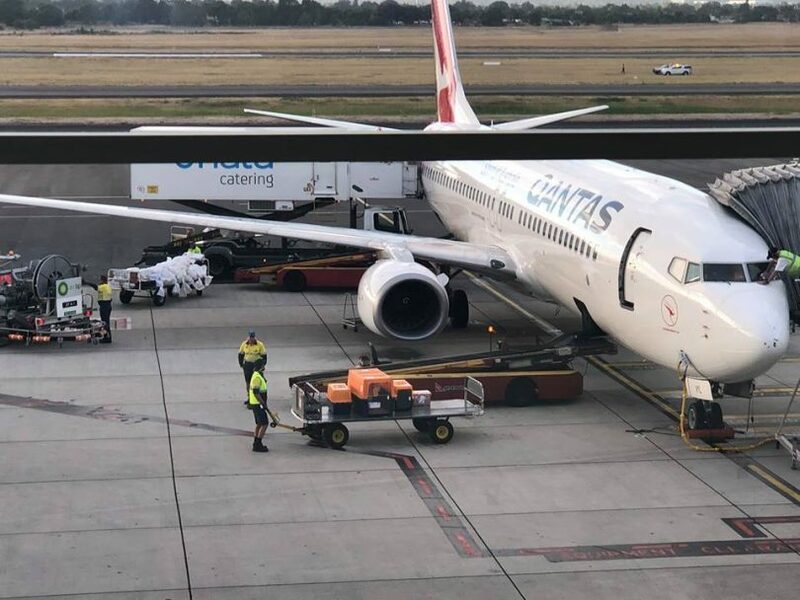 Despite being creatures of habit, “they don’t particularly like change” but Steve says he is happy with how Gorge and Adelaide are adapting to their new carers and environment following the flight from South Australia. 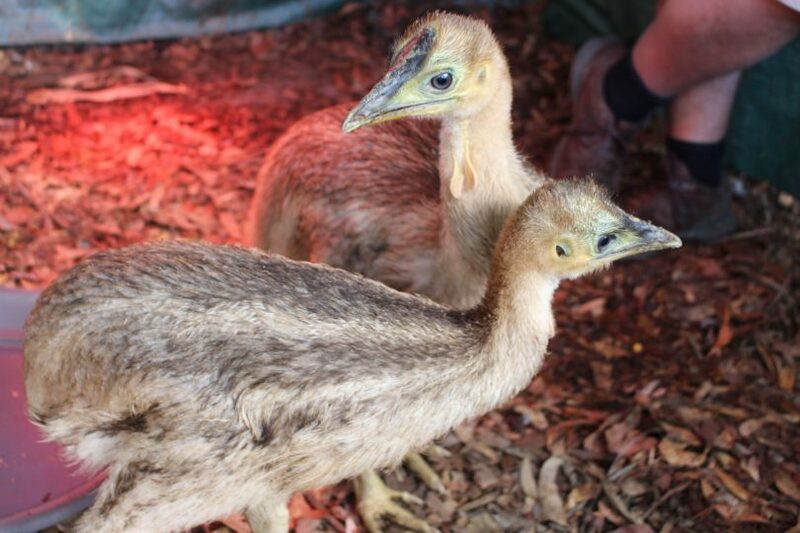 Construction of the new Southern Cassowary enclosure was made possible by a NSW Government – Destination NSW Regional Tourism grant and these two, gender unknown birds will need every inch of it. Fully grown, they are “super impressive”, with their mum standing at 2 metres tall and weighing 82 kg. The males of the species are smaller, coming in at around 50 kg. Steve says he is happy with how Gorge and Adelaide are adapting to their new carers and environment following the flight from South Australia. Photo: On the Perch Facebook. Over the next three years, these siblings will develop the large prehistoric helmet or casque the species is known for on the front of their head. “There has been a lot of discussion about what the casque is actually for, for many years we thought it was a weapon, these birds do have a reputation for being dangerous,” Steve says. However, the red wattle that hangs from the bird’s neck, its striking black hair-like feathers, and blue head and neck will come first. Alex Metcalfe preparing the Cassowary’s feed. Photo: Ian Campbell. Once on public show, what might surprise some is seeing Gorge and Adelaide eat their poo! “They have one of the shortest digestive systems in the world,” Steve explains. The other twist in this big birds’ make up is the role the male plays in raising young. 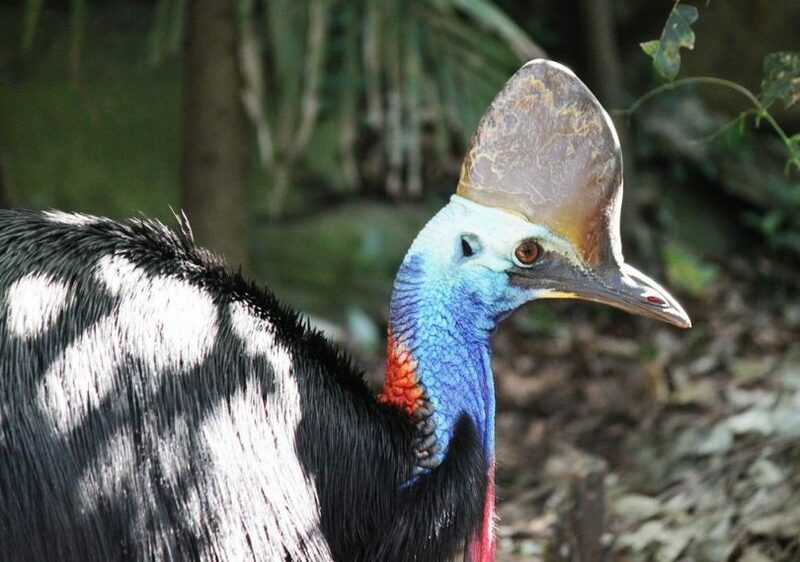 Fully grown, the Cassowary is “super impressive” Photo: Australia Museum. Alex Metcalfe has just been appointed Cassowary Keeper at On the Pearch and takes on most of those parenting duties, preparing the 8 kg of food each bird will eventually need every day. 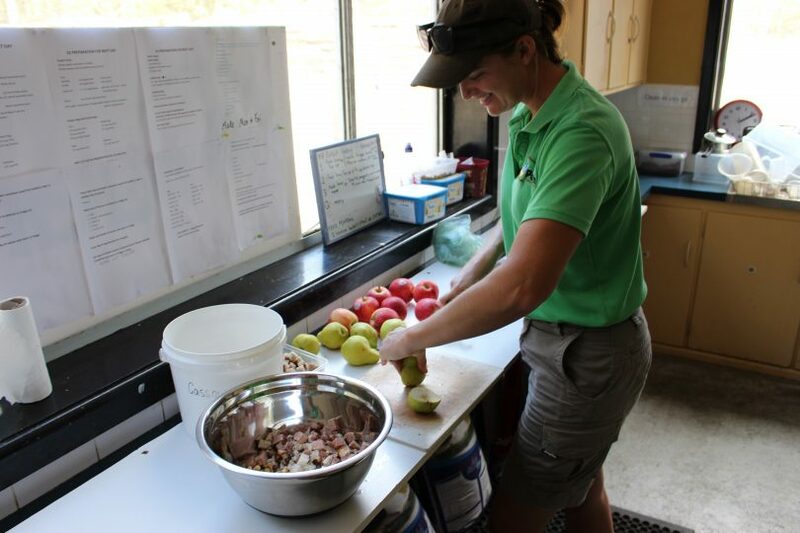 “They get chicken hearts, dog roll, bread, corn, peas, apples and pears, all cut up into small pieces so they can throw it back, they don’t chew,” she says. Both Alex and Steve feel the weight of having such special creatures in their care, “there have been some sleepless nights,” Steve confesses. Alex Metcalfe and Steve Sass. Photo: Ian Campbell. Headed into winter these birds, normally found in the tropics of North Queensland and Papua New Guinea, are ready to grow and succeed. 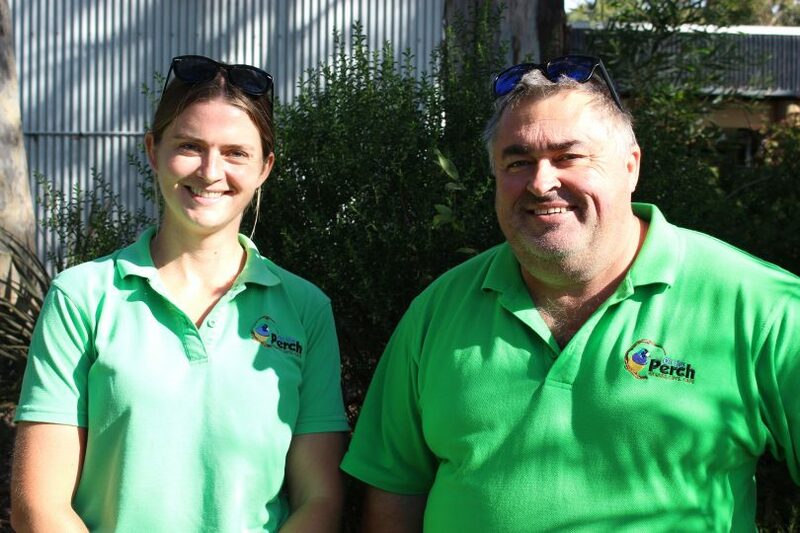 Their new home is protected from the Bega Valley’s biting southerly winds and coming from stock raised in the Adelaide Hills, Steve is confident they will acclimatise well. That said, Steve is reluctant to announce a date for public viewing, keen just to take one step at a time with his new feathered friends. From there, On the Perch is developing a range of close encounter opportunities for visitors as Gorge and Adelaide become comfortable with being on show and are ‘trained’ to interact with people. LIVE at On the Perch Bird Park near Tathra with Steve Sass and his new babies – Cassowarys! These guys aren't on public display just yet, you get a sneak peak.